Welcome to the Scottish National Portrait Gallery. 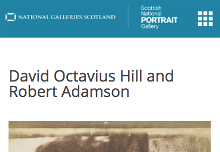 This tour will take you through the display A Perfect Chemistry: Photographs by Hill & Adamson, sponsored by EY, telling more about these pioneering photographers and the works they created. There are 16 stops in total and the tour will take around 30 minutes. Look out for the headphones symbol in the exhibition and then hit the number you’re in front of to begin. Press the menu icon at the top right of the screen to go to a different stops. You can also use the buttons at the bottom of the screen to move to the next or previous stop.